To purchase this product, you must provide evidence of your qualifications in test use. We can accept the completed application form, a relevant membership number (HCPC/BPS), or a copy of your applicable degree or certificate (master, diploma, specific training). You can either upload the document directly during the checkout process, or send it to us directly by email or fax. We reserve the right to ask for further evidence of qualification as necessary. 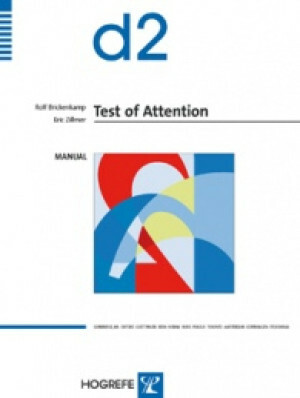 The d2 has become one of the most widely-used measures of attention - particularly visual attention - throughout Europe. Used not only within clinical and educational settings, it is also used within the pharmaceutical and transport sectors, and finds further application in areas such as sports psychology. The d2 Test of Attention has been praised for its value in measuring focus of attention - you can read more about its success with the Nottingham City Transport's new driver training programme here. Please note that the new d2-Revised is now available here! The d2 consists of 14 test lines with 47 characters in each line. Each character consists of a letter, 'd' or 'p' marked with one, two, three or four small dashes. The test taker is required to scan the lines and cross out all occurrences of the letter 'd' with two dashes while ignoring all other characters.